In a very large bowl pour the bags of chow mein noodles in and spread them out. Melt the vanilla flavored candyquik and stir until smooth. (I use the instructions on the package.) Then pour the candyquik over the noodles and gently stir to coat. Once they are evenly coated, use two spoons to make them into haystack or nest shapes on parchment or wax paper. 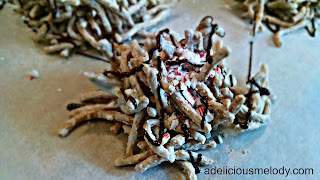 Then sprinkle crushed candy canes on the tops and drizzle with chocolate to finish! Let set for a few hours at room temp or 30 minutes in the fridge. Then package and/or enjoy! Easy, peasy and yummy! Cream shortening and sugar until well blended. Mix in salt, vanilla, baking soda and eggs until combined. Add flour 1 cup at a time until just combined. 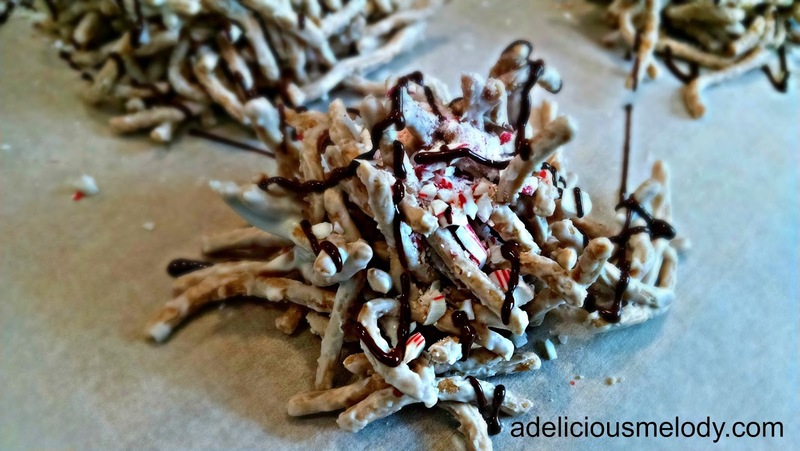 Then stir in chocolate chips and crushed peppermint candy canes. Refrigerate for at least 1 hour. 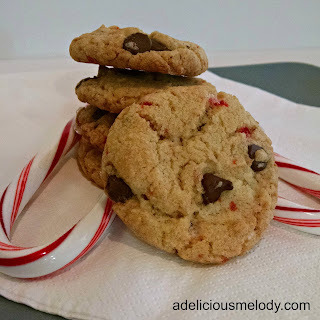 Then using a cookie scoop (or whatever you like to use) place on a parchment paper lined cookie sheet about 3" apart. Bake at 350 degrees for 10-12 minutes or until golden. I've made a lot of peppermint bark over the last few years. I sometimes layer dark and white chocolate, or just do one or the other. I've decided this is probably the easiest and best way to do it though, so I made a little video. Let me know what you think of it!